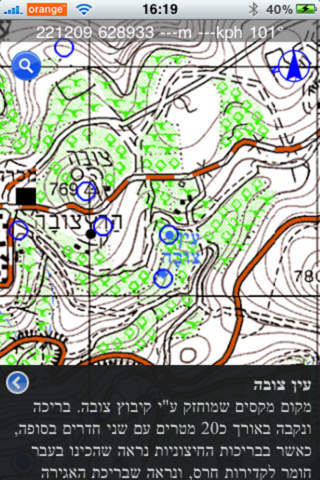 Each circle is a “site” in Israel, with good information on each, from Amud Anan. 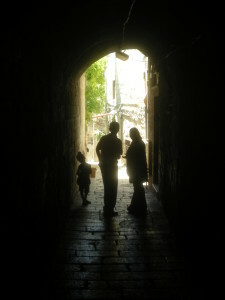 For starters, there is an excellent app with a series of audio tours around different parts of Jerusalem’s Old City. Available in eight different languages, these tours are largely the same as a series of tours that were available for free in printed form at the Tourist Information Office inside Jaffa Gate. They were smart enough to realize that a Smart Phone app was less expensive and more accessible! Not quite as good, and still in need of more development and completion, is VisiTLV, the official app for Tel Aviv-Yaffo tourism. In addition to some walking tour routes (that have too little information so far), there are also links to free guided tours, public art, restaurants, bars and hotels. You may have noticed that I wrote 12+ apps, up above. That’s because for a few I am offering alternative options. One of my absolute favorite apps for Israel touring is Amud Anan (Hebrew for “pillar of cloud,” like the one that guided the Jews in the desert). 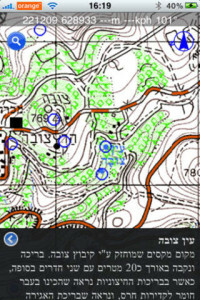 The app features user-generated content on hundreds, if not thousands of sites throughout Israel, all pinned onto a GPS-enabled map. Unfortunately for many of you, however, the app is only in Hebrew. So a site that offers some similar usage, albeit with a drastically different interface, is AcrossAir. It superimposes location-tagged info from WikiPedia, YouTube and other sites over what you see via your phone’s camera when you point it in the direction you are looking. Speaking of Hebrew, if you have some basic knowledge of the language, but not that much, a good translation app will be useful. For Hebrew, I prefer Morfix. Available for multiple languages, this is the English-Hebrew one. I find it much more accurate than Google Translate, though it lacks the ability to translate sentences. But what about talking to the friends you left behind to tell them about how awesome this country is? Who wants to spend money on a long-distance calling plan? I again have two options for you. In both, anyone else who installs the app can connect with you for free. All you need is WiFi (which is fairly commonly available across Israel). The more popular one is Whatsapp, which gives you free texting and media messages. But I prefer Viber, which gives you voice calls to anyone else with the app. A great free option! I am not someone who likes talking politics. But at the same time, when in Israel it is often difficult to avoid. So the least you can do is stay educated! While many people prefer the HaAretz newspaper, their app requires a subscription to read beyond the headlines. So I am not including them in this post. But the Jerusalem Post has a fairly comprehensive app with a lot of (though not 100%) free content. Okay, so there you have the first six, plus two more alternative options. Check back in tomorrow for Part 2, where I will write about apps that will help you get around, and interact with Israeli culture with greater ease! Thanks mate for excellent apps recommendation. I’ve never been in Israel before, so these apps are going to be very good companion of mine to trip and enjoy Israel locations without any getting lost fear. Cooper recently posted…Which is better Tumblr or Blogger? There are also other cities with self-guiding apps that you can download into your phone. For example, the city of Ramla has an excellent one (currently available only in Hebrew, unfortunately) that gives you a GPS-guided tour with explanations. Before visiting a city on your own, check out your app store or the local municipality’s website to see what’s available.